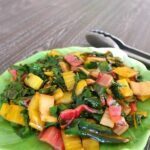 This Sautéed Rainbow Chard is a fantastically delicious – and colorful – low carb and keto side dish recipe! 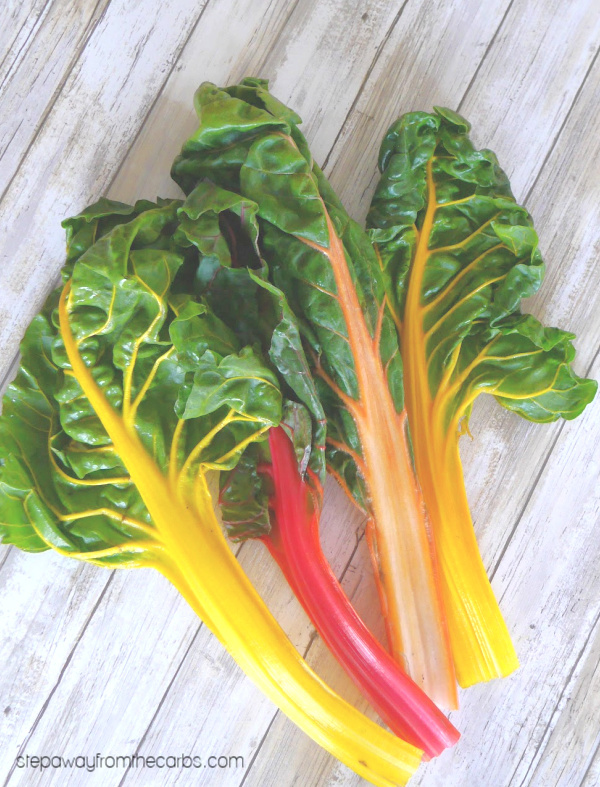 Rainbow chard isn’t actually a name of a specific vegetable, it’s a mixture of colored varieties of swiss chard. Although the red variety looks rather like rhubarb, it’s actually part of the beet family, and can be prepared in a similar way to kale or bok choy. 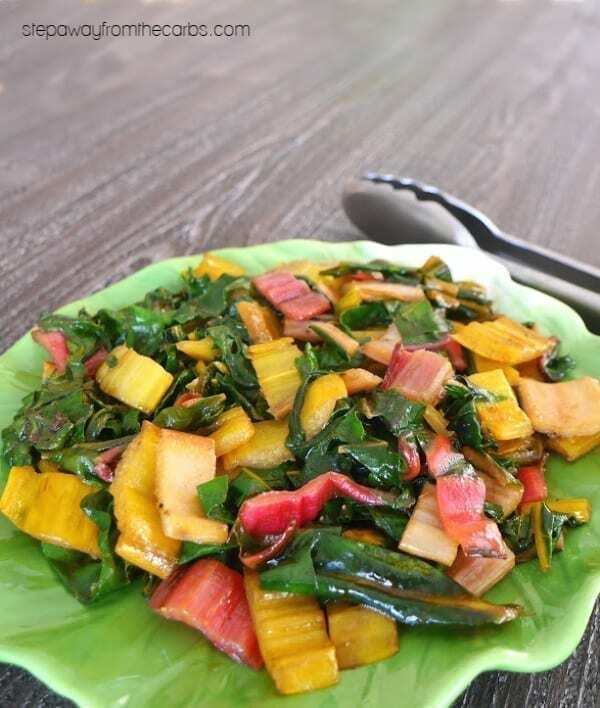 A serving of three cups of raw swiss chard contains just 1.8g net carbs. It’s a good source of vitamins A, C, K, plus magnesium, manganese, iron, and potassium. 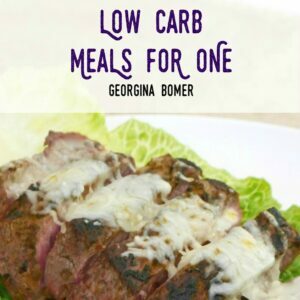 In this recipe, I’ve kept the vegetable very simple: I sautéed it in butter with a little added garlic, and finished with a tiny splash of balsamic vinegar. I should note that I don’t use balsamic vinegar very often, as it’s the only vinegar that isn’t zero carb. 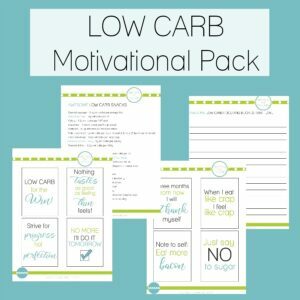 One teaspoon contains 0.9g of carbohydrates – and 0.8g of that is sugar. 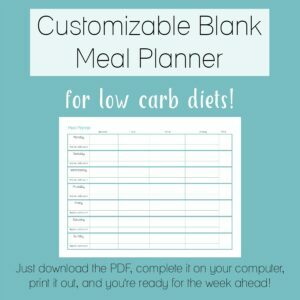 It might not sound like much but it certainly can add up if you use it too liberally. You prefer, however, you can just omit the balsamic. 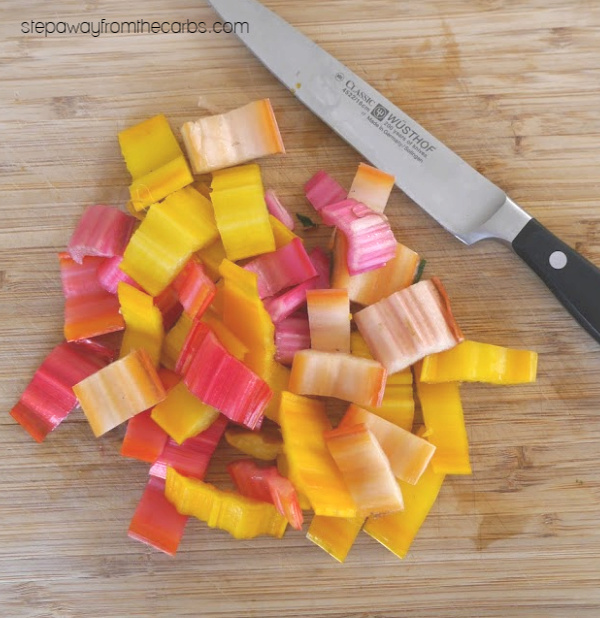 To prepare the rainbow chard, trim the stalks and chop them. Melt some butter in a large skillet and add the chard stalks and some garlic paste. Meanwhile, slice the leaves down the center (where the stalk is), then cut them horizontally into slices. When the stalks start to soften, add the leaves. Such a colorful pan! Continue to cook until the leaves have wilted, then add a splash of balsamic vinegar and season with salt and pepper. This sautéed rainbow chard works perfectly with grilled meat or fish. It certainly brightens up any meal! 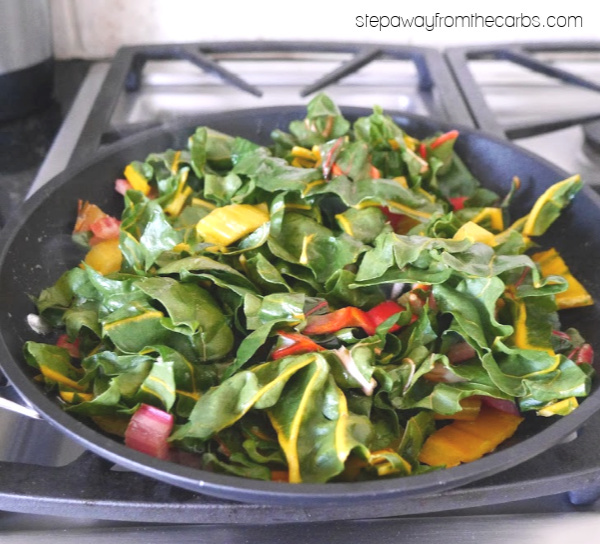 This Sautéed Rainbow Chard is a fantastically delicious low carb and keto side dish recipe! 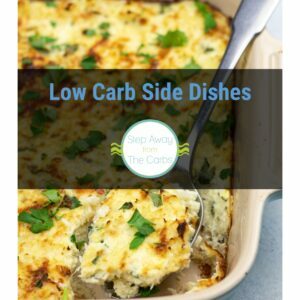 Melt the butter in a large skillet and add the chard stalks and garlic paste. Meanwhile, slice the leaves down the center (where the stalk is), then cut them horizontally into slices. When the stalks start to soften, add the leaves to the pan. Continue to cook until the leaves have wilted, then add a splash of balsamic vinegar and season with salt and pepper. Serve warm.